Notes: "A Bronze Age Stone Row lies just inside, and is partly buried by, a substantial field boundary. The row extends from SX57217155 to SX57007137, some 294m long and includes at least 57 visible stones. 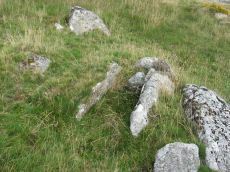 Its north-eastern end is denoted by a substantial blocking stone and its lower south-western end by three funerary cairns. The row can be seen as three distinct parts forming the whole. 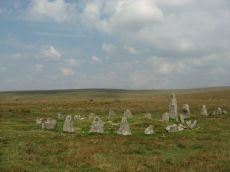 The northern part includes 39 stones, the central group of 8 stones is separated from the northern row by a 66.2m wide gap whilst the southern group is on a slightly different alignment to the others. 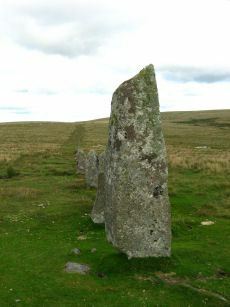 The row is unusual in that the blocking stone is at the upper end and a cairn lies at the lower end." Lethbridge diagram and photo p.24. Notes: "cairn mound measures 15.5m in diam and stands up to 1.5m high. A t-shaped trench cutting into the centre of the mound suggests partial early excavation, though the results of the investigation are not known. This cairn forms part of a ritual complex of monuments including 3 cairns, a stone alignment and enclosure". 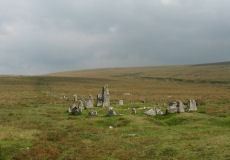 Approx 70 m NW of the cairn circle at the end of the Down Tor stone row. Notes: Dixon #93. Bar Rep. 67. Butler Down Tor S.
- Vol. 3. Map 47.5 (diagram p.67). Grinsell WALKHAMPTON 26. Notes: Turner E34 (OS SX58376957). Dixon #108. Bar Rep. 73. Butler Hingston Hill N. 3. - Vol. 3. Map 47.13.3 (diagram p.73 OS SX58396955). Grinsell WALKHAMPTON 29 (OS 58276949 approx - same as HER MDV3499). Lethbridge p.27 Cist No.1. Notes: Dixon #109. Bar Rep. 73. Butler Hingston Hill N. 1. - Vol. 3. Map 47.13.1 (diagram p.73 OS SX58386956). Grinsell WALKHAMPTON 28 (OS SX58256951 approx same as HER record MDV3498). Lethbridge p.27 Cist No.3. Notes: Dixon #107. Bar Rep. 73. Butler Hingston Hill N.2. - Vol. 3. Map 47.13.2 (diagram p.73, OS SX58376955). Grinsell WALKHAMPTON 27 (OS SX58246950 approx - same as the HER record MDV12715). Lethbridge p.27 Cist No.2. Notes: The cairn circle is 9.3m across and consists of 14 tall slabs some of which have fallen. Wilkinson noticed concentric stone circles - which can't be seen today although there is clearly an inner circular mound. NMR A. 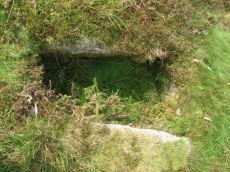 Notes: "Hingston hill pound, east of down tor, is a circular enclosure whose wall consists of large stones. Entrance is marked by a slab like stone which extends through the thickness of a wall. 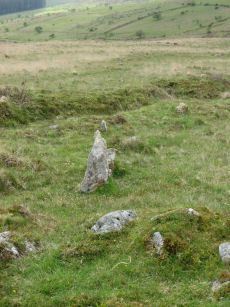 About 100m from the pound in a direction 15 s of e lies the centre of a cairn, c.18m in diameter at the base. 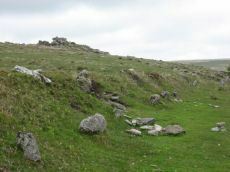 The down tor stone row points to this cairn (Worth)". Lethbridge pp.27-29, diagram p.27. Listed as Narrator Brookhead Enclosure on Megalithic Portal. 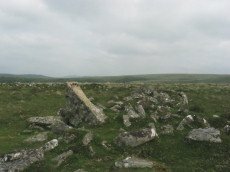 Notes: The large cairn to NW of Down Tor (Hingston Hill) stone row has been claimed to contain a cist or "elements of chambering" (Burnard via PMD). 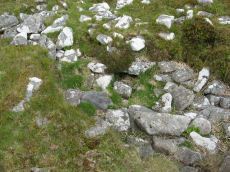 A stony round cairn located on the flatish sadle of Hingston Hill. 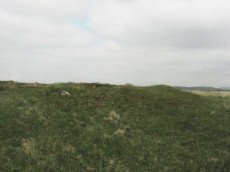 The cairn mound measures 17 metres in diameter and stands up to 1.5 metres high. A hollow in the centre of the mound measures 4 metres long, 3 metres wide and 1.2 metres deep, and is probably the result of partial robbing or early excavation. The edges of the mound are steep-sided, indicating the existence of a kerb, which now survives mainly as a buried feature. A quarry ditch surrounds the mound, visible as a 1.5 metre wide band of rushes on the northern side of the mound, the result of increased moisture in the buried ditch. 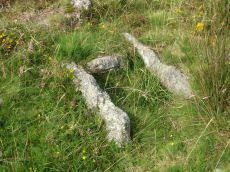 This cairn is in direct line with the two terminal stones at either end of a stone alignment to the south-west. 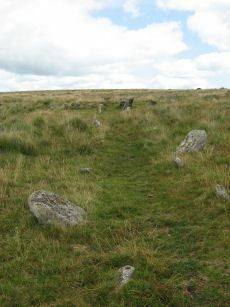 Notes: "A stone alignment and cairn, situated on a saddle 620 metres east of Down Tor. The alignment is orientated east-north-east to west-south-west, running for 316 metres and containing at least 174 stones, with the tallest at either end. The westernmost stone stands 2.8 metre high, the easternmost stone stands 1.6 metres high, and the remainder vary between 1 metre and 0.2 metres in height. The westernmost stone, and an unknown number of others, were re-erected by Baring-Gould and Burnard in 1890." Notes: Turner F6. 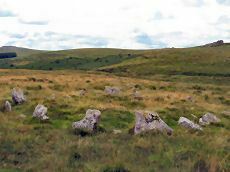 "The cairn circle consists of 26 upright stones and possibly two more now recumbent; it has an internal diameter of 11.5m. 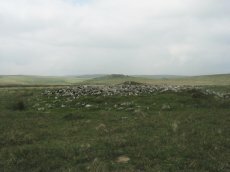 Within the circle is a cairn of 8.5m diameter and 0.6m height with a small depression in the centre which may be the site of a cist". Lethbridge pp.27-29, diagram p.27. Notes: "A Bronze Age enclosed hut circle settlement. 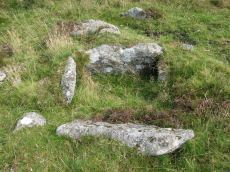 The remains lie on a northerly hillslope and now comprise a D-shaped enclosure wall of boulders and stones containing about twelve hut circles. A small D-shaped enclosure is attached to the uphill south-east side. The northern part of the settlement has been effaced by a tinner's cliff, part of the Hart Tor Brook streamworks. This well preserved settlement now lies under low bilberry bushes." Notes: Turner E29 "much disturbed". Alleged cairn circle. 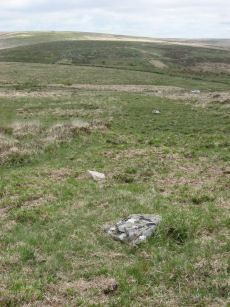 NMR record states "At SX 56897029, a felled conifer currently obscures much of what appears to be a hut circle rather than a cairn, situated on a south-east slope near a valley bottom. (Identification as a cairn may have originated with H. Breton)." Notes: Dixon #92. Bar Rep. 66. Butler Leeden Tor S. 2 - Vol. 3. Map 45.13 (diagram p.47). Grinsell WALKHAMPTON 23. NMR A.